New Haven, CT – Today VR Business Sales – Mergers & Acquisitions, Marcum LLP, and the Law Firm of Zangari Cohn Cuthbertson Duhl & Grello P.C. 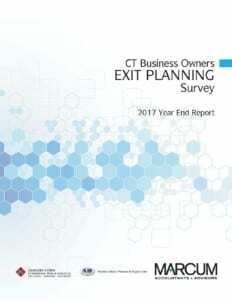 released the 2017 Year End Report of the CT Business Owners Exit Planning Survey. The Connecticut Business Owners Exit Planning Survey was created to measure owner readiness and sentiment for selling a business in Connecticut for business owners. VR Business Sales – Mergers & Acquisitions, Marcum LLP and the law firm of Zangari Cohn Cuthbertson Duhl & Grello P.C. teamed up to conduct this survey because of the Firms’ and our clients’ interest in issues related to exit planning for business owners, with the belief that we need to quantify the challenges ahead for business owners as the population ages and to further develop better exit planning strategies.